Airplanes and Rockets website visitor Michael M. wrote to request that I post this article, along with the ones for the Satellite 1000 free-flight champion, and The Giants of Free Flight. 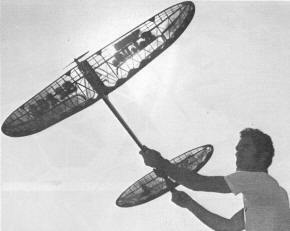 His reason was that he wanted to get his flying team back together again in Bill Hunter, who passed away recently. 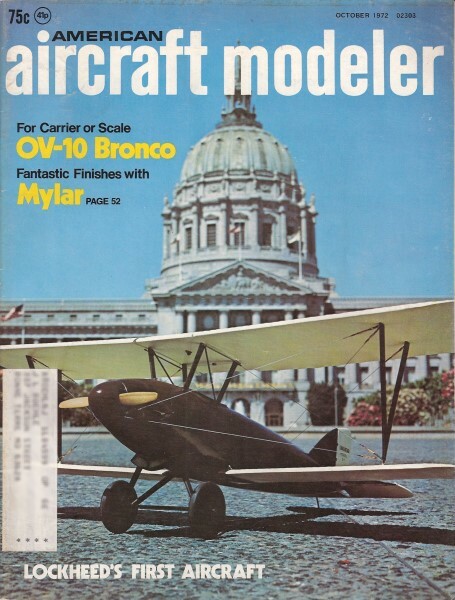 This article on covering with Mylar is very extensive and is another example of such efforts that were common in hobby magazines of decades ago - a large part of my motivation for making them available. It is rare to see such in-depth articles in today's publications, where the focus seems to be more on cramming in as many different topics as possible to provide something for everyone in every issue. Of course it wouldn't be so if consumers didn't demand it. At this point relatively few even know that articles such as this one could be found in just about every edition of magazines of yore. Ultralight and highly colorful sheet plastic is great for FF ships. Here's how to work with it and where to get it. What is Mylar? Glad you asked! Mylar is the best thing since the phone call from that farmer in Fresno saying: "I found your model and the cows only ate one wing tip." Mylar is a clear, paintable, space age polyester film, manufactured by DuPont. Several different grades are produced, all of which will heat shrink at various temperatures according to the use designated. We have chosen a grade in the 275° heat shrink range, so that after heat shrinking with a "Sealector" iron, it is least affected by weather and temperature changes. After shrinking, it will withstand direct heat to 150° with no change. Thickness of the Mylar governs weight, so we've stayed within one quarter thousandth to one thousandth (1/4 mil, 1 1/2 mil, and 1 mil) using the thickness determined by our own research, for the particular type model we wish to cover. How light is it? How strong? Is it fuel proof? Easy to use? Can my models look as good or better using Mylar, than they do already? All of these questions have been asked and I'll try to provide the answers. Weight of 1/4 mil Mylar is .8 gram per sq. ft. (clear); 1/2 mil is 1.6 grams per sq. ft. (clear); 1 mil is 3.2 grams per sq. ft. (clear). As a comparison of weight: Jap tissue less dope weighs 1.5 grams per sq. ft. (28.35 grams = one ounce.) The tensile strength of 1/4 mil is 6250 lb./sq. in. ; 1/2 mil is 12,500 lb./sq. in. ; 1 mil is 25,000 lb./sq. in. Such strength results in extremely high puncture resistance with great resilience. Mylar is definitely fuel proof. Clear Mylar may be left to set in pure nitro methane. When cleaned off and dried, it can be used ,as described with no effect showing. 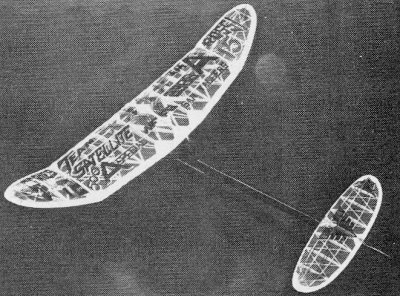 The finished plane shows its geodetic structures. Mylar adds little strength, so its lightness can be offset by beefier structure design. Only one word can describe this model - beautiful. S.T. 65 drives this Class C-D ship skyward at extreme velocities, yet 1/4 mil Mylar over Jap tissue worked fine and even survived DT landings in Volkswagen size rocks. Thin cutout is paper used to mask the wing ribs for spraying adhesive. With heat iron, attach Mylar to dihedral break ribs and around edges of structure - just like MonoKote. Pull and stretch while heating. Compound curves are a cinch. 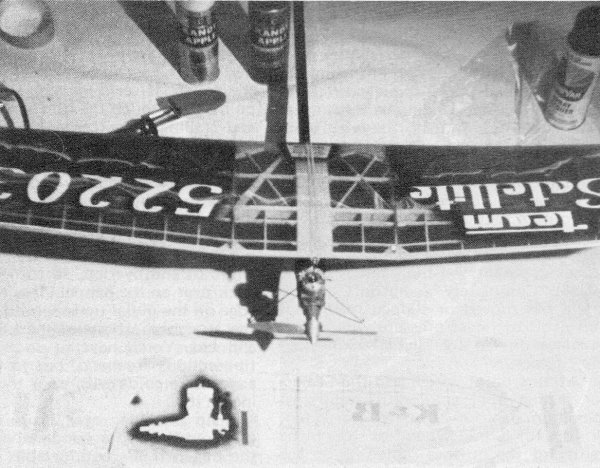 Complete wing and stencil layout of stab covering with spraying of K&B engine in progress. The ease in using Mylar is demonstrated by the fact that a 'C' Special Satellite 100 sq. in. wing, prepared as later described, can be ready to fly within one hour from covering, start to finish. The reflective brilliance of a Mylar­covered surface is most easily compared to that of glass. Since all paint work is done on the side that will be placed against the surface to be covered, even the smallest 1/2 model looks like it has fifty coats of hand-rubbed dope, yet weighs less than a doped model of the same structure. An added advantage to Mylar is the very low surface drag which becomes important as the model's speed increases under power. We combine the use of Mylar-covered flying surfaces with a fabulous new epoxy paint process, developed by K&B Manufacturing Co., called Super Poxy which we use on all balsa fuselage and fin surfaces. The Super Poxy process virtually eliminates the dust-epoxy problem, since it sets up dust-free in twelve minutes at 70° and is fuelproof flyable in twenty-four hours. Light weight again is the name of the game since using Super Poxy involves only: sanding balsa smooth; coating with K&B resin/catalyst combination; covering with K&B's new one and two- tenths thousandth superlight fiberglass cloth (1/4 the thickness of a human hair) and blotting the excess resin up with tissue. The resin/catalyst sets up in from five minutes to an hour depending on amount of catalyst used and does not get brittle or become waxy. When set, spray on coat of K&B primer with primer catalyst and K&B thinner. After primer is dry, sand lightly with 220 grit 3M tri-cut silicone paper and spray one coat of your favorite K&B Super Poxy color. (Mixing color charts are available at your hobby shop.) No further sanding or rubbing is necessary and the reflective brilliance rating is 98% that of glass. Trim colors with Super Poxy may be sprayed after 24 hours. We use vinyl plastic tape - it is extremely thin, bends perfectly around curves and corners and leaves a super-thin paint edge which requires no sealing for bleed under. Note of caution: K&B's research and development of the Super Poxy process has been extensive, with best results for the modeler's use as the prime target. They have succeeded so don't try to substitute other products into the process. 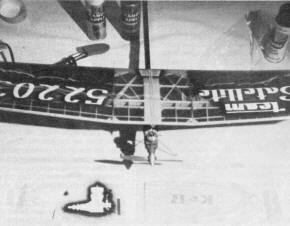 As a finished example of the total Mylar Super Poxy process, see the photo of the Satellite "500" A-Special. The engine, pan mount, timer and accessories weigh 11 oz. and the model weighs nine oz. with 1/2 mil Mylar covering. 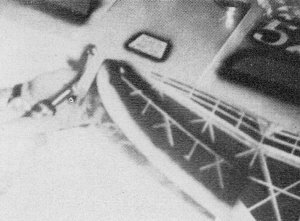 We have found Mylar to be an ideal covering material for all sizes and classes, of models, from indoor penny planes covered with 1/4 mil (don't shrink it), through U-Control Combat to the largest 1300 sq. in. Satellite class C-D jobs at 1 mil. Now we can build strength into structure as never before, so tissue, silk and dope are things of the past. Semi-geodetic construction is used on all Series 70 Satellite classes, and flutter-free surfaces result utilizing Mylar to its best advantage. Our 300 sq. in. 1/2As come out at six oz. ready to fly and the 1000 'C' Specials barely make 34 oz. The records set and held by the Series 70 Satellites, covered with Mylar, are extensive, i.e., all of the 1971 Category IA, B and C Free Flight Junior records, the 1971 Category I Open C record at 73:24, 1972 Category I Open C record at 34:54, 1972 Category I Open B at 24:04, and the latest Category II Open C record at 26:41. In addition, the Satellite 1300 holds the Western States special Class D record at 25:00. 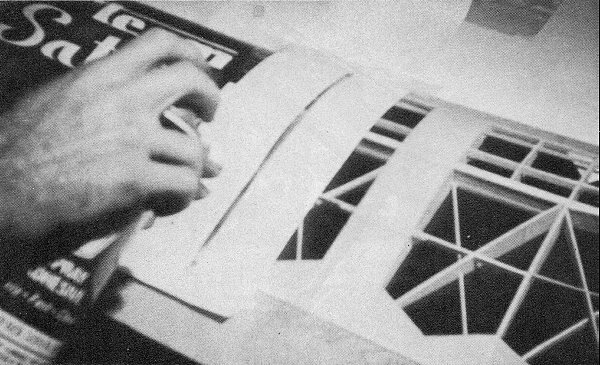 I realize that Mylar is an entirely new medium for most modelers, and for those who have developed their skill with tissue, silkspan, silk, and dope, the change could be mind-bending. I've been a member of the glue-chewing fraternity for over seventeen years and changes in method don't come easily to me either, but "try it, you'll like it!" The procedure for painting and covering flying surfaces is as follows: Color must be added to the clear Mylar unless you want to drive the timer crazy! To paint the Mylar on a clean, workbench, layout a rectangular section, twice the chord plus a couple of inches for overlap (all around) of the surface you intend to cover. Tape the section to the bench where necessary to stretch out any wrinkles or creases. To do a solid translucent color with no lettering or design, shake a spray can of your favorite color of "Kandy Apple" brand lacquer, and lightly spray the Mylar. Let it set about three minutes and spray again. You'll start to see the color you desire by now. Don't try to make it too deep, as it is translucent. When you are satisfied with the color, let it set to dry. I usually check on the very edge with my finger tips. 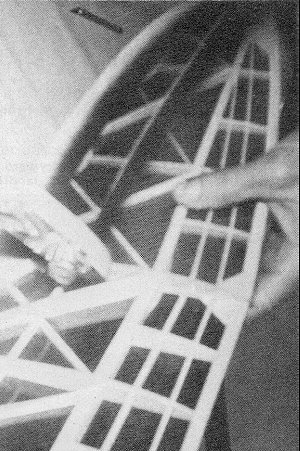 An adhesive is applied to the framework of the wing or stab. We use 3M "77" clear spray contact cement. We've found 3M 77 to be the best available, after experimenting with many different types. The container holds 23.5 fluid ounces and it's enough to spray contact several huge "C-D" free flights. Dry weight is 1/10 fluid weight. Hold the framework to be spray contacted up away from any other material and lightly spray the entire framework particularly the outline, and bottom. As an example of how much spray contact should be applied, passing the spray over one entire side of a Class "C" stabilizer should take no more than six seconds. Then hang it up to dry for a few minutes. Even when the spray has dried for ten minutes or so, it will still feel a bit tacky, especially if you've sprayed your fingers! We always cover the bottom of any surface first, so let's suppose you have spray contacted a flat bottom wing, such as the Satellite. The Mylar you have painted is still taped to the bench. Set the wing right down on the painted Mylar, locating it so that you'll have enough to cover full length in one piece, and also so that plenty is left chordwise to cover the top, with overlap. Look down on the wing outline and with a sharp blade cut the Mylar all around the edge outline. Leave some overlap to allow for error. When the Mylar has been cut all around, tip the wing spanwise, first to one side and then the other, to pick up the Mylar with the slight tackiness remaining from the contact spray. Turn the wing over and set the center section on something so it will stay where you put it. Now something very important becomes apparent. All the paint is on the inside! Completely fuel proof! If the Mylar has moved or slipped readjust it and a bit of finger pressure will hold it in place due to the slight tackiness of the contact. At this point we plug in the Sealector sealing iron, and set it at 50% of maximum heat for 1 mil, 45% for 1/2 mil, or 40% for 1/4 mil. When hot, touch the center of the bottom center rib on the Mylar with the tip of the iron. With just the touch, it seals immediately at that point. Now touch the iron at the leading and trailing edge (center rib) the same way. Do the same at the dihedral breaks and at the center of the tips. Since the wing has polydihedral, we slice the overlap with a blade out away from the dihedral joints at the leading and trailing edge. This is a good time to do away with a lot of the overlap, so turn the wing back over on the bench. Place a straight­edge on the Mylar up to within 1/16" of the straight portions of the LE and TE and cut. You'll have to do the curved tip sections freehand, but just use the edge for a guide with your thumb resting on it. Flip the wing over again; now you can hold it in your hand rather than on the bench if it's comfortable. With the sealing iron at right angles to the edge to be sealed, touch the iron gently to the Mylar with a downward wiping action all around the outline. Do not shrink the Mylar on the bottom at this time! For the top of the wing, it's best to cover the tips first and, since the Mylar must overlap when cut into tip, outboard panels, and center panel sections, be sure you start your first tip cut far enough to one side of the Mylar on the bench to allow for the overlaps. To do a tip, prop the wing up, so the tip lays flat on the Mylar. Mark or cut the Mylar about 3/8" inboard from the tip dihedral break. Cut around outline of the wingtip leaving at least 1/2" overlap all around, to allow for curvature (camber) and sealing under later. Remove the Mylar tip portion from the bench and place it on the opposite tip, paint side down, overlapping the dihedral rib. 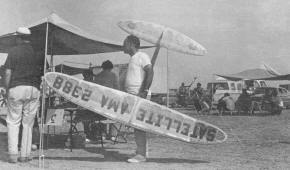 Carefully razor cut slits in the overlapping portion at the tip dihedral rib, away from the rib, toward the center of the wing. This is done to allow the Mylar to fit the curve of the rib well, and to allow the overlap to be sealed down the vertical side of the rib. Some contact cement was sprayed on the side of the dihedral rib when the top and bottom of the framework was done, but it's a good idea, at this time, to take the tip piece off. Lay it paint side up and, using a piece of paper as a shield (outline of tip), spray the tip overlap and the outline overlap light with contact. Replace the tip Mylar when contact is dry. Fit so that the razor slits line up on the dihedral rib, and press down the slit portions along the side of the rib with a finger. Slit the outline, away from the leading and trailing edge, at the dihedral break rib. Touch the sealing iron to the top of the dihedral rib in the center and at the LE and TE. Also touch at the very tip edge and, with a wiping down motion, several spots around outline. Using the same motion, now complete the seal. Using the tip of the iron, heat seal and slit overlap sections you pressed down on inboard side of dihedral rib. The maximum amount of overlap needed is about 1/4", so if you have an excess around outline, trim with a sharp blade or scissors. Slit these, in the center of each wrinkle, on the overlapping portion only and seal under with the Sealector iron. Now that the tip is covered and sealed, you may want to find out how it shrinks up. First, take a straight pin and puncture a small hole in each sealed bay to allow air to breath in or out when shrinking. Starting at the tip on the bottom, just touching the surface, pass the iron over the first section. Go to the top of the wing, and starting at the very tip, touch the iron to the surface and pass it back and forth from LE to TE slowly, and as you move in toward the tip rib you'll see those wrinkles disappear. Satisfied? Don't go any further! Do the other tip! Everyone who has ever covered a polydihedral wing, straight or elliptical, has had the problem of tissue, silkspan or silk pulling up across the dihedral angle; Mylar is not different. With a bit of extra balsa, you can your rib template and cut two sliced ribs from 1/8, 3/16, or 1/4 sheet to fit the top camber. Fit and cement these slices next to the tip dihedral rib on the inboard side. You'll have to cut them at the spars. You now have a thicker rib on top at the tip dihedral break and something extra for the outboard panels to contact to. We've been using a new clear liquid contact cement for jobs such as this called Permabond. It has the consistency of water and if you have a section fitted such as the sliced ribs, place one drop on the crack and it penetrates and hardens in three seconds. Sure saves time! Any excess on the surface just sets there so wipe it off with a piece of tissue. If you get it between your fingers, get the razor blade out and prepare for surgery! This material is very similar to Eastman 910. It doesn't warp structure (I build indoor jobs with it) and works great on plywood/balsa or balsa/balsa lamination as well. Now to cover the outboard sections: Lay a piece of paper with a slot cut in it over the Mylar, balsa tip dihedral break and spray contact that area. Set the wing down on the rest of your painted Mylar, and cut the outboard panels, allowing for overlap at the inboard dihedral breaks and also for the center panel to overlap those breaks by at least 3/16" past the ribs. Set the outboard panels in place, paint side down, touch iron same as tips, to center of outboard dihedral rib and inboard dihedral rib and at the LE and TE both ribs. To contact the overlap along LE and TE, lay a card on the bottom of the wing near overlap and spray lightly. Let dry and trim to 1/4". Complete seal same as tips. No balsa fill is needed here since the angle is shallow. Use the same piece of slotted paper to spray contact the Mylar over the inboard dihedral rib. Fit the center section and seal. It sure took a lot more time to write this than it has to cover the wing. Pin hole the rest of the sealed bays in the outboard and center sections and start shrinking from the tips in. Do a bay on the bottom and the same on the top and keep moving in. Any excess spray may be cleaned away with turpentine or auto enamel reducer or lacquer thinner - just a few drops on a cloth. 3M also makes a 1/2" chrome Mylar self-sealing tape that looks great on the leading edge and flashes well in the sun. When your ship is out of sight the flash can still be seen and can give you extra time on the watch. By the way, if you twisted a warp in or would like to put some wash-in or wash-out into a surface, just heat up the iron, secure the surface at the position you like and pass the iron over and under again - that will set it. I usually leave a wing or stab on the ship to do this, then I don't have to hold the center. Cut sections of poster board that exactly fit the spanwise length of all panels. Leave the chord of these pieces about an inch wider than both the leading edge and trailing edge. Set the bare framework down on the poster board and draw an outline with a ballpoint pen. Tape the poster board sections together with 3/4" or 1" masking tape across the chord leaving each section about 1/2" apart from the other. It doesn't hurt to mark the dihedral breaks also. With a straight edge draw in the center spar, spanwise, or any straight register line. Doodle in your lettering and design ideas with a soft pencil. When you've arrived at something you like, use angles, straightedges and curves to solidify your idea with a ballpoint pen. Tape the poster board down. Get out the No. 11 blade and X-acto knife and cut all those neat designs you've figured out. Be sure they are free and cut clean, but don't lift them out yet. Write on each cut piece, what it is and where it goes (the center of the second A in AMA, for example). At this point I use five plastic bags - one for each panel and put the cut out parts from each panel in a separate bag. Never did care for jigsaw puzzles! Wow look at that stencil! Sure did get carried away, didn't you? Let's paint. Secure your clear Mylar to the bench as described earlier. You probably won't be doing letters on the bottom of the wing so cover that section of Mylar with taped paper for now. Turn the stencil over, end for end, so the letters are reversed. Place the stencil over the clear Mylar. Mylar doesn't show pin holes and they won't cause rips, so pin the stencil to the Mylar at various spots near cut out portions of the stencil. This holds it down in that area and when you spray through the cutouts, a clean line results. How about doing the letters first? Look in the plastic bags and get the centers of As, Ps, Bs, etc. and pin them in place. Cover all other stars, stripes, moons, and whatever you don't want painted or fit the cut out pieces in. Fitting is easy since they are all identified. I used black letters with gold edging later. Spray the letters with whatever color you've decided. Do it lightly and then again. Let dry. Replace the cut out and spray blue, then replace them. Spray the stripes and replace. To get the gold shading on the black letters, pull all the pins out of the stencil, move it down toward the TE about 1/8" in with the letters out, so you can see through, pin around the letters, and lightly spray Kandy Color gold base. As soon as this is dry, remove the stencil and look at the results. A whole gang of letters, stars, strips, and bars over clear Mylar! Are they all sharp? If any edges are too fuzzy or have bled, don't despair, Use a very fine brush and little lacquer thinner and clean it, then dry with a Kleenex. This won't affect the Mylar at all. In fact, if you don't like the job, soak a rag in thinner and wipe it all off, and do it over. Painting only takes a few minutes anyway. We always use the lightest color for the main color because it can be sprayed lightly and look great. In the case of the Satellite "500" A Special, the main color is Kandy Color Lime Gold. Whatever color you choose, remove the paper shield from the other section of your taped down Mylar at this time, if you want the top and bottom to be the same color, and go ahead and spray the entire piece. You might want to pin stars back in place since lime gold, for instance, could turn blue stars green. Covering and heat shrinking involves the same process as earlier described. Just remember what you registered your design from, such as the center spar, and lay it up that way. Be certain to allow for all overlaps when you cut the separate panels. You can turn the Mylar paint side down and put the stencil under it, and your previously marked points for dihedral breaks will show through. This will assist in making your cuts. It's a good time to put all of the pieces back in the bags and hang up your stencil someplace. It will come in handy if you want to do a T-shirt or another wing in a different color just to show what kind of an artist you really are. Mylar is very tough, but all models get rips, tears, snags and holes eventually. If you are at a contest and the covering is damaged, it can easily be repaired on the field with scotch tape and later the section can be replaced with Mylar painted the same as the rest of the surface (contact the edge of the repair to seal). I've had a pound of bacon go through the top of my wing tip from the refrigerator in my trailer and in this case I used MonoKote "trim film" over the huge hole and went ahead to win the San Valeers Annual in Class C.
To keep your surfaces gleaming like new, clean with a soft cloth and DuPont Enamel Reducer (small amount) and dry with another soft cloth. Refer to the following for size, use, price and ordering information: 1/4 mil (.00025), Penny Plane, 1/2A, Coupe, light Sport Gas and Rubber, 50 sq. ft. at $5.00; 1/2 mil (.0005), 1/2A, A, Wake, Unlimited Rubber, (1/2A, A Sport UC), 50 sq. ft. at $7.50; 1 mil, B, C, D Gas, Sport and Combat UC, 50 sq. ft. at $10.00" To order, include fifty cents postage. 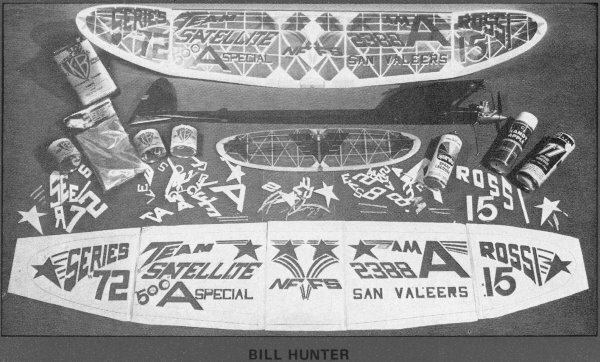 Send checks or money orders to: Bill Hunter, Satellite City, 9486 Sandusky St., Arleta, Calif. 91331. Sources of other materials: "Kandy Apple" Lacquer and DuPont Enamel Reducer - Auto Supply Stores; 3M 77 Spray Contact Cement and 3M Chrome Tape- Hobby and Craft Shops, Auto Supply Stores, or call nearest 3M representative; Sealector Sealing Iron (may use household iron - Hobby Shops, or Seal Inc., Derby, Connecticut; Permabond Contact Cement - Satellite City; Poster Board - Art Supply, Stationers, Drug Stores; K&B Mfg. Super Poxy 30 - Hobby Shops. Other films available at Hobby Shops for covering models include Citizenship's Silictac and Top Flite's Super Monokote.